I clean my face with oil, wash my hair only two or three times a week, and while I do shower every day, I don't scour myself like mad from head to toe. So the logical next step on the "no 'poo" path: co-washing my hair. I'm totally down with the whole clean-not-clean movement that's happening right now: I clean my face with oil, wash my hair only two or three times a week, and while I do shower every day, I don't scour myself like mad from head to toe. So the logical next step on the "no 'poo" path: co-washing, or conditioner washing, using a cleansing conditioner but no shampoo. The idea behind co-washing is that it's a gentler way to clean your scalp and hair: Without the harsh detergents found in shampoos, hair maintains its natural oils and stays healthier. It's supposed to be especially great for dry and curly hair. (In fact, many women with coarse or curly hair have been doing it for years.) And no, it's not a shampoo-plus-conditioner; there's no lather involved at all. I decided to give cleansing conditioner a try for a month. 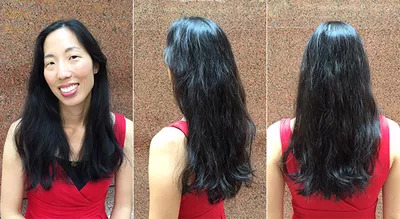 I have thick but fine-textured hair, mostly straight (but a little wavy), and slightly oily—in other words, not the ideal candidate for co-washing. Would I end up drowning in my own greasiness? Here's what happened. Once upon a time, Seventeen magazine told me to lather only my scalp and condition only the length and ends of my hair. That's how I've been washing my hair ever since. So the directions on my bottle of Unwash Bio-Cleansing Conditioner ($36, amazon.com) freaked me out: Massage a sizable amount into the scalp, work through to the ends, and rinse. Conditioner on my scalp??? Ew! Well, I am here to report that it feels…exactly like rubbing a big handful of conditioner into your scalp. Gooey. Disconcerting. But the Unwash combs through to the ends nicely (though it's not super "slippy" like some conditioners), and rinses out feeling clean. When I combed my hair afterward, I was surprised that I actually had fewer tangles than with regular conditioner. You know how right after you wash your hair, it can be a little unmanageable and flyaway, but by the end of the day or even the next day, it's softer and holds a style better? The best way I can describe the way my hair felt after co-washing is to say it was like second-day hair. Soft, but with a little texture (not slippery like squeaky-clean hair can be). I didn't need to use as much styling product, either. And here's something fascinating: It actually seemed wavier than before. I liked it! I'd hoped that co-washing would cut down on my shower time, given that I was eliminating a whole step. But truthfully, it took just as long to massage the stuff into my scalp, then work it through to the ends, as it would to shampoo and condition separately. Maybe even longer, since I was being extra thorough with the scalp massage out of paranoia that I wasn't getting clean enough. When I started co-washing, it was the height of a grimy, humid New York City summer. I used cleansing conditioner after long sweaty workouts, days at the beach, and encounters with my 3-year-old, who likes to lovingly stroke my head with yogurt on his hands. Impressively, cleansing conditioner got out all the grime. And no, I didn't smell! …After I adjusted, that is. Around week two, my scalp had a weird freakout and suddenly seemed much oilier and flakier than usual. It even made my face feel oilier. I'm not going to lie, I was grossed out—and I'm someone who was already comfortable having not-squeaky-clean hair (remember, I only shampooed a few times a week). Apparently this adjustment period is pretty normal if you go no 'poo, and all the websites swore the greasies would subside as my hair and scalp adjusted to the new routine. Sure enough, after about a week, everything calmed down and I no longer felt like a walking grease bomb. In that first month, I used shampoo just once, after a day at the pool with my kids; I figured I should thoroughly wash out the chlorine. I shampooed and used regular conditioner, just like I always used to do. And I hated the way my hair felt. Even the next day, it was drier than I'd become used to—crunchy, even.